Memorialized across the United States in its centennial anniversary this year, the towns of Oak Park and River Forest were embroiled in the conflict from the first shots fired in Sarajevo in 1914 to the eventual 1919 armistice. Many local inhabitants were abroad as Europe mobilized in early August of 1914, with the August 15 edition of the Oak Leaves urging local residents to “send in any information of the whereabouts of Oak Parkers abroad” as borders closed, communication froze, and upwards of sixty residents became marooned in the whirlwind of hostilities. However, information managed to find its way back to Oak Park, and by August 22, mostly favorable reports were sent in to the Oak Leaves as stories of prominent local residents fleeing Vienna, Paris, Munich, and other European hotspots filled the weekly subscription. One Oak Park resident was even almost lynched as a German spy for speaking the Kaiser’s tongue in Paris, but just managed to escape to the states following “harsh interrogation,” by French forces. Just as Oak Parkers attempted to flee from Europe, some local residents and supplies actually went the other way. The Red Cross raised money at the local Trust and Savings Bank, and Oak Park even sent its first volunteer to fight on August 19th, as 223 South Kenilworth resident Henry Luken left the United States to fight for his birth nation of Germany. The hearts and minds of America were focused on Europe, and despite its proclamation as a moral high point among the region, Oak Park businesses were not exempt to the fear mongering the war enabled, as some attempted to advertise their stability or resources in the face of the war enveloping the United States. However, when war came to the United States, local residents were quick to enlist, as 2446 civilians were shipped off to fight. Serving gallantly, Oak Parkers fought across the French and Italian fronts, achieving various medals of accomplishment. Legendary native Ernest Hemingway, only an eighteen year old at the time, was actually the first American wounded in Italy, and for his heroic rescue of an Italian veteran was awarded the initial American Silver Star of Valor in the region. Not the only local celebrity to achieve national fame, River Forest native Lt. Alan Winslow achieved widespread recognition, as he became the first American to shoot down a German aircraft. 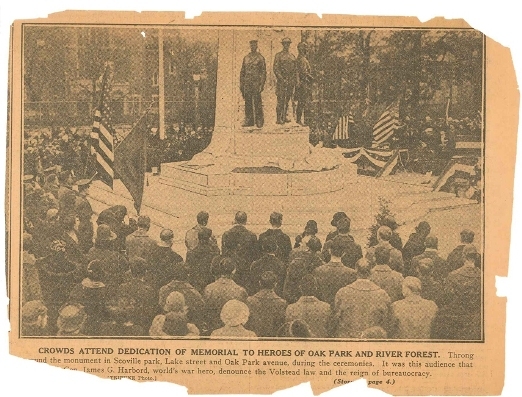 Although vaulted in combat, World War 1 hit Oak Park greater than any event past or future, as 185 residents were killed. No demographic was spared as football national champions, prominent businessmen, and even a local priest were killed in conflict. Although World War One left a massive impact on Oak Park, the town managed to get a few shots in itself. From Verdun to Versailles, its local heroes became national heroes as they vaulted the town to regional prominence in warfare. Although the war’s legacy lasts on in many aspects of local life, its solid form can be seen today at Scoville Park in the bronze names of the 2446 natives that served.